Hope everyone had a great weekend and ready to start the new week! Today's bento didn't require a lot of efforts, I just made the 2 pigs from rice onigiri and put them inside silicone cups. The ears were made from fish ball, eyes were from nori and fish ball. I run out the pink kamaboko so I decided to use pink dyed hard boiled egg. Soaked the egg too long while I cooked the veggie and chicken ... made the pink nose too pink :p Oh well! No time to redo it. I used small heart cutter and small straw to make the nose. I saw this from one of my Japanese bento book, pig's nose from upside down heart shapes. Inside the green box : kumquats, cherry tomatoes, sauteed baby kail-an/Chinese kale with oyster sauce, fried egg, and pan fried chicken. Looks delicious, as usual! I love the polka dot background. My fave. The pink color doesn't make any less of cuteness of the pig , Lia. Wish u a great starting og the week! The pink colour is striking, cute. good tips on using heart shape as nose. I hope I can find some nice polka dots paper too for background, love them! I love your bento blog, your lovely creations never fail to cheer me up. Under your influence, I have been collecting the bento books and would like to ask for the ISBN number of the book that you gave out on your 1st anniversary celebration. Thanks very much in advance. That is sooo cool! Love the super pink nose. hehe.. Getting the kid ready for last week of summer day camp and it is sooo hard to be inspired right now. I'm just loving going through all your bento pics! Have a great day Lia! @Kurosakurambou : Thanks a lot! I actually like the pinkest upside down snouts!! They are made more adorable that way. I love the piggy picks too! Whr did you geht them? 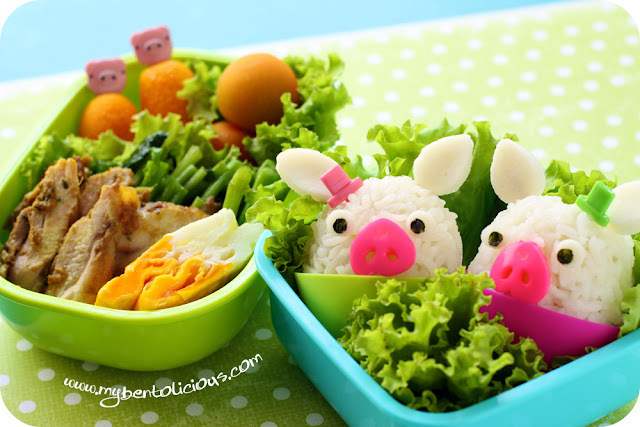 Such cute little piggies...the bento looks yummy! Look at those cute piglets!! It's sad that the bento frenzy came to Indo so late, I never had the chance getting cute bento from my mum...Maybe one day I should make some bento for my future kid(s) ;). @Kuusou : Thanks a lot Kuusou for your sweet comment! the piggies are sooo adorable! I like it bright pink! Makes them stand out even more! what a great idea to use the heart as nose! Does your kids eat all the lettuce too and come home with an empty bento box? @Sonoma Bento : Thanks a lot SB! Awww... those little piggies are just too cute! Chicken and egg finds its way into lots of my bento lately too! But I wish I had some cute piggies to go along with them! @sherimiya : Thanks a lot Sheri! How about piggies from egg? Squeals! Love the piggies, love the little hats and hot-pink heart snouts--darling and so fun, Lia!! @anna2003 : hehehe ... Thanks a lot Karen!